You will hit your mark. There is no such thing as “close enough”. If the crossfire does not nail you as you pierce the miles to earth, the snarling Brute behind the Carbine rifle aimed on you will. So, don’t get all proud on me, you hear? Take a deep breath, hell jumper, you’re an ODST now! Happy landing! Did I leave… the gas on? 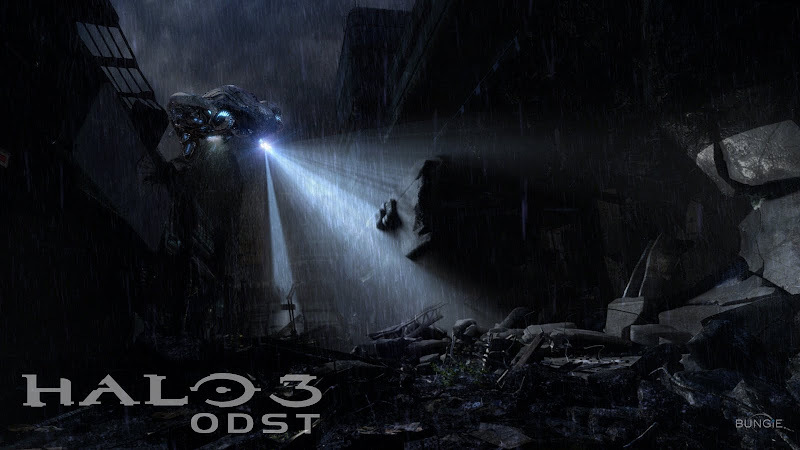 Halo 3: ODST is a charming pet project by the makers of this little under the radar franchise you may or may not have heard of known as the Halo Series. The series has done pretty well for itself, and even secured a movie deal with the help of this guy! Recognize him? He’s the one with the pet T-Rex that ate Michel Ancel in the last installment of Pixels and Pies. Poor, poor little French man. Anyway, the project fell through, which was a bummer especially after seeing how excited the Bungie staff became on a tour of the WETA workshop where items like the classic Magnum and the Worthog were at their disposal. With a large window now open to them until their next project – Halo: Reach – Joseph Staten and his team found themselves with a lot of spare time. Thus, ODST. (l to r) Adam Baldwin as “Dutch” and Alan Tudyk as “Mickey”. A moment of brotherly love. The ODST have been fan favorites for years, proving to be as popular with them as the Master Chief is with his own fan base. 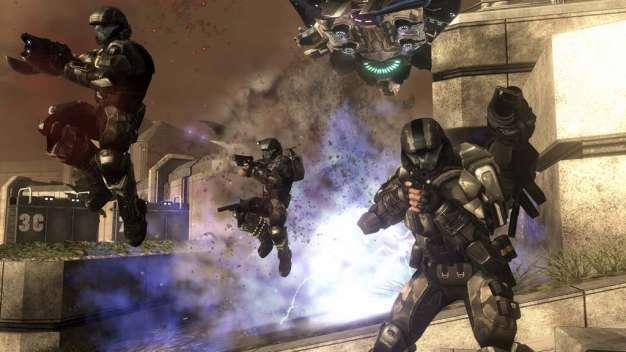 Although a video game never seemed obvious, at least from my perspective, the promise of ODST on store shelves was not only enticing, but also completely natural. So, you start the game as the Rookie, the newest, quietest member of a ragtag ODST troop. You serve with Buck, Mickey, Dutch, and Romeo. The team is a typical ODST team, very verbal and tightly knit, which works because they are supposed to contrast the silent, stolid Master Chief. Anyway, this group of bro-mancers are shaken up when their team is put in the hands of new management – Veronica Dare. She also happens to be Buck’s ex-honey. She also happens to be on a super, duper, maxi, ultimate secret mission! Before you can really get into any of that, you are in your HEV, and being launched through an aerial battle to the African streets below. But, of course, it all goes horribly wrong, and you get knocked off course, and completely separated from your squad. No problem! Now, you have a game to play. The game itself is an interesting idea that centers around the Rookie before veering off at the very end to pay more attention to the flat and uninteresting Veronica and Buck. This is a shame because I feel like ending the game on these two really cheapens the Rookie’s place in the game as our protagonist. It’s a shaky ground. With the exception of Veronica, you play as all of these characters too. I still feel like the Rookie is the main guy, considering the other characters have their story told through flashbacks triggered by the Rookie when he finds items coordinating to the other characters. 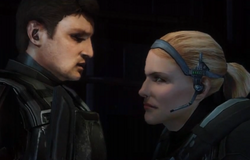 (l to r) Nathan Fillion plays “Buck” and Tricia Helfer plays “Dare”… two characters with nothing but love for each other and random acts of pettiness. Tangent over! The interesting idea I began on up there sees the Halo universe in another light: the dim light of a film noir. Within the execution of a detective story, the Rookie works to solve the mystery of his missing team mates all the while accompanied by a jazzy, dark score that feels like it was written by a pair of venetian blinds, a stick of bright red lipstick, and a smoking cigarette. As the Rookie navigates through the beautifully rendered and realized New Mombasa, he is brought face-to-face with the enemy. You can decide to engage or avoid them at your discretion. Considering the flashbacks involve the rest of the ODST team in typical Halo combat, it seems the formula that was attempted here was the theme of a stealthy mystery game, cut with the gameplay you have come to know and love (or hate) from the Halo franchise. However, you are not rolling with Master Chief these days in ODST. Before you can meet up with your team, fantastically characterized by the boys of “Firefly”, you are relying on a 3D rendered map of the city that now replaces the HUD so common in the Halo games. Also, you have the option of switching over to night vision, which will enhance objects in a yellow highlight, and the bad guys are red. You have some new weapons, a new shield to consider, and for the first time ever – health packs! As beautiful as New Mombasa is, the fighting arenas within it can become somewhat repetitive. There are places where the streets converge on a concrete oasis, and that’s usually where you’ll find your Convenant waiting for the bus… or to kill you. Either one. When there are patrols marching the streets, there is an element of excitement to that, but these patrols were rare, with the Oasis Teams winning the majority of conflict areas. You could usually expect the same numbers as well. So, these became predictable, and there were even periods with little to no fighting. As this gripe pertains mostly to the night levels with the Rookie’s… when most Covenant are probably resting or something, I suppose the point is moot on a logistical level. On a technical level I would like to fend off more Covenant. Not just at the end, game! … Though that was pretty sweet. There was an interesting concept with the city in that it served as a guide for the Rookie. Signs indicating “Detour”, “Keep Left”, and “Dead End” are supposed to be a signal to the players of conflict or destination. There are also small audio files you can find around the city that put together a story about a girl who has also picked up on the city’s urban lingo. The idea of the city itself trying to help you is a really cool one, but done a little too subtly to fully appreciate right away. Eventually, the concept of Halo 3: ODST wears off on me. I had this problem in the last two Halo games as well. The universe is appealing to me, I really am drawn into the stories and backgrounds of the good and evil in it, but there is something extremely repetitive that kicks in about five hours into a Halo game. I’m usually repaid by a cut-scene full of plot that encourages me to grind through the next level to find out what happens next. Luckily for me and the game, when I’m about to hit my stopping point… it ends! Zzzzz… wake me up when the exposition is over. This one wraps up in about… 10 minutes, so it’s short and sweet. Playing the game on-line – especially in Firefight! – is an added plus. Also, the Bungie team includes a Halo 3 multiplayer disc that has all the updated maps as a consolation prize. So, even if you don’t like the game, you can take out your aggression on ten-year-old prodigies in Sweden, and teabag till the Covenant come home. It’s definitely worth checking out, but with little replay value, it only serves as an interesting peak at the lives of the ODST and a fun fan service. Hey, at least you get access to Halo 3 multiplayer without having to pick up Halo 3, as well as Firefight. Stay tuned for the dish inspired by the game – Beef Tenderloin cooked in a Salt Dough HEV! Awesome! It was fun going through the game with you but, yeah, I was probably done just before it ended. 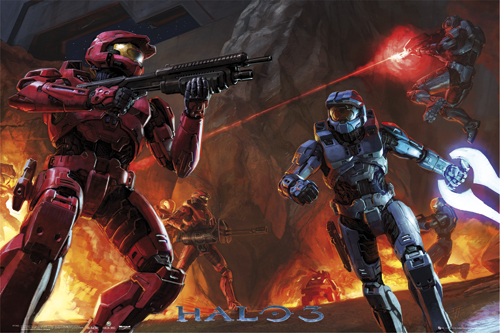 I don't know why I like Halo less than another shooter like Gears of War, but I do. Still, the story was fun.A couple of the pictures aren't working. Is that happening on your end? Yeah, actually, I'm going through and fixing it now. I'm thinking about going with pics from IGN.com. They have pretty awesome screen shots for the posted games, and I think as long as I give them some credit and love, it should be all good.